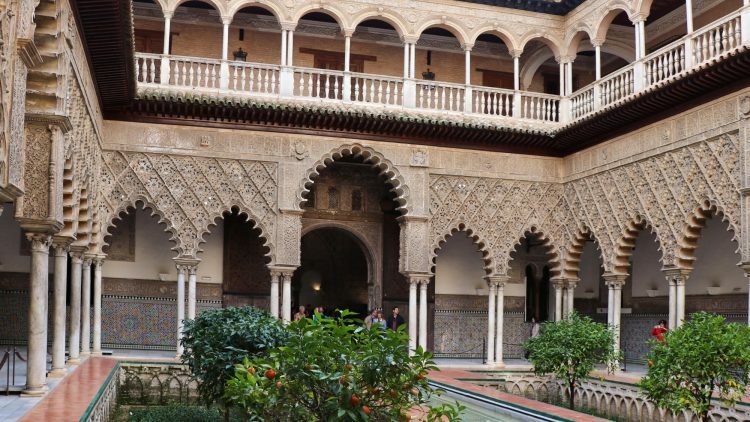 The top tip for seeing the Real Alcazar de Sevilla is to buy skip-the-line tickets in advance. Visit in the afternoon to avoid tour groups. The Real Alcazar palace complex in Seville is one of the top sights to see in Andalusia and indeed Spain. It is a deservedly popular attraction but a bit of planning makes it easier and more pleasant to visit the site. The best tip is to buy tickets in advance, whether standard skip-the-line tickets or tours. The number of visitors allowed inside at any given time is limited so it is generally equally busy at any given time but mornings are more popular with tour groups. Visit first thing in the morning is the most pleasant but late afternoon when the complex gradually empties is also a great time to visit. Limited information is posted inside the Real Alcazar – take a good guidebook, get the audio guide or book a guided tour. Buy tickets for the Real Alcazar online in advance – the small surcharge is more than worth it even on quiet days and a brilliant investment on busy days. Resellers such as Ticketbar only add savings if further tours and combinations are added. Book tours in advance to ensure availability on dates and times that are convenient. Free admission is possible the final hour on Mondays. Buy a free ticket online – it has a €1 “telematic” surcharge but is more than worth it. Children up to 16 enter free (but need a time-slot reservation too if planning on using the skip-the-line queue). Students 17 to 25 and seniors over 65 receive discounts – IDs are frequently checked. Only 750 visitors are allowed inside the palace complex at any given time. Visitors with tickets have preferential admission at all times. Visitors without tickets queue outside with no guarantee of actually entering the palace at all. Even with time-slot reservations, short waiting times may be necessary on very busy days. See Buying Tickets for the Real Alcazar in Sevilla for more details on ticket options. Book Real Alcazar Tours at GetYourGuide. The 15 rooms of royal apartment (upper floor) are not included in the basic ticket for the Real Alcazar. It is seen on an audio-guided tour with very strict time-slot reservations. If buying the royal apartment tour (Cuarto Real Alto) online, the time printed on the ticket is the time visitors must be at the entrance door on the second floor. Enter the Real Alcazar any time before that time on the day leaving at least half an hour spare. Once this tour has started, it is not possible to catch up or visit later. Many consider the almost €5 surcharge for the royal apartments hefty for little, especially when familiar with or planning to see other royal palace interiors in Europe. 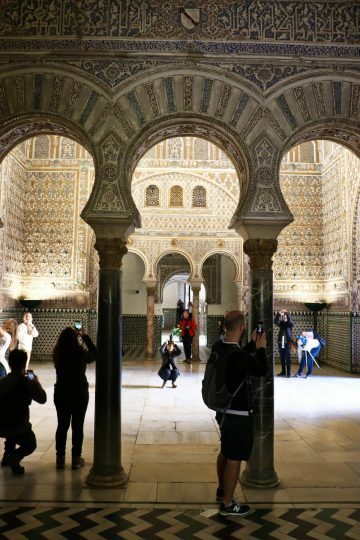 The furnishings are mostly 19th century with the true attraction of the Real Alcazar the Mudejar palace that is covered by the standard ticket. 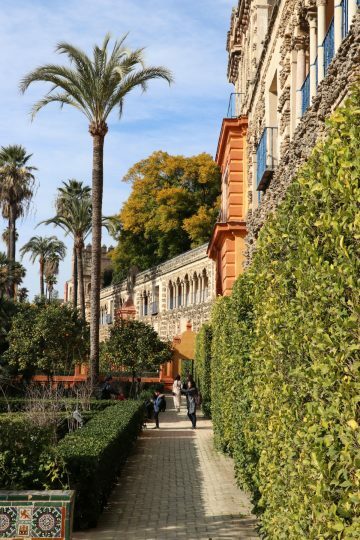 The best times to visit the Real Alcazar palace complex and gardens in Seville are like for most top tourist sites in Europe first thing in the morning (9:30) or towards the end of the day. Try to avoid weekend and holiday periods. The complex is generally busiest from just before 11:00 to mid-afternoon. Afternoons are generally the quieter time of the day to see the Real Alcazar – the palace is particularly busy with tour groups in the mornings. Allow at least an hour to see the palace complex and another hour for the gardens. It is easy to spend much more time in either and both are pleasant places to linger longer. If entering first thing in the morning, skip all sights at the entrance and go directly to the Patio de las Doncellas and Salon de los Embajadores inside the Mudejar Palace of King Pedro (10 & 15 on the current free map). Then retrace to see the sights nearer the entrance. The entrance to the Real Alcazar is through the Lion Gate across Plaza Triunfo from the cathedral. It is allowed to stay inside the palaces and gardens until closing time, as long as visitors don’t exit the entire complex (at Patio de Banderas) – re-admission tickets are not available. The Real Alcazar palace complex and gardens may be visited without a guided tour. However, very little information is posted making a good guidebook, audio guide or guided tour almost essential to appreciate the intricate details and history of the complex. The free map, available at the entrance, is handy to not miss any of the rooms open to the public inside the big labyrinth complex. It has very little other information. There are no one-way systems or restrictions in which order the various palaces and rooms are visited. Visitors may retrace steps and visit rooms and different palaces multiple times – a good idea if groups hog rooms – most move on fairly quickly. Only the optional royal apartment tour (Cuarto Real Alto) must be seen at a specific time and with an audio guide. 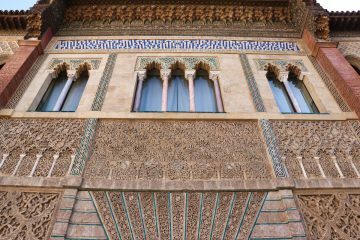 The highlights of the Real Alcazar are the architecture and fixed decorations. Most of the rooms, with the exception of the optional royal apartments, are unfurnished. The most impressive parts are often the ceilings and higher wall sections that remain clearly visible even when the palace gets full. Food options are surprisingly limited given the high number of visitors and the physical size of the palace complex and gardens. The cafeteria in the garden serving basic snacks and drinks is the only café in the complex. Toilets are available off the Patio de la Monteria before entering the main Mudejar palace, near the café and at the far end of the garden. 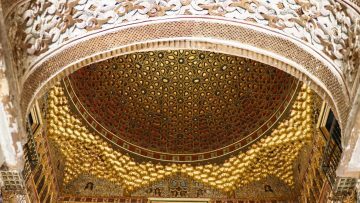 See also a descriptions of the highlights when visiting the Real Alcazar and tips on buying skip-the-line tickets.